The KW coilovers made of stainless steel enable a significant increase in driving dynamics and safety combined with a stylish lowering. Now they are also available for the new VW Passat with 4motion all-wheel drive. 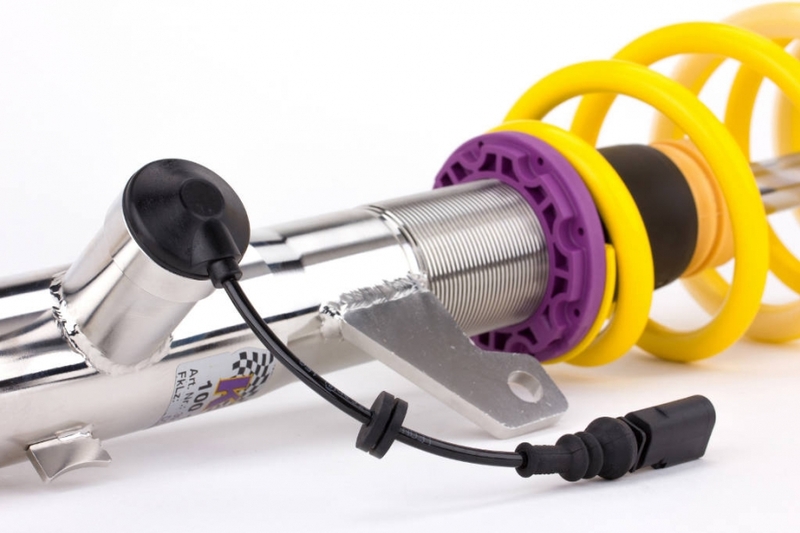 The continuous lowering is made at all KW coilovers via the dirt-resistant trapezoid thread directly on the stainless steel strut. At the front, the Passat 4motion can be lowered within the approved adjustment range of 35 – 60 mm. At the rear axle the adjustment of the vehicle height is made directly at the rear-axle height adjustment between 20 – 45 mm. The suspension control of the adaptive KW DDC plug&play coilover kit works via the VW Series Sensors and it directly controls the KW valves. So during suspension installation, actually only the standard suspension has to be replaced by the KW suspension and the KW DDC plugs have to be connected to the original VW plugs of the VW suspension control (DCC). 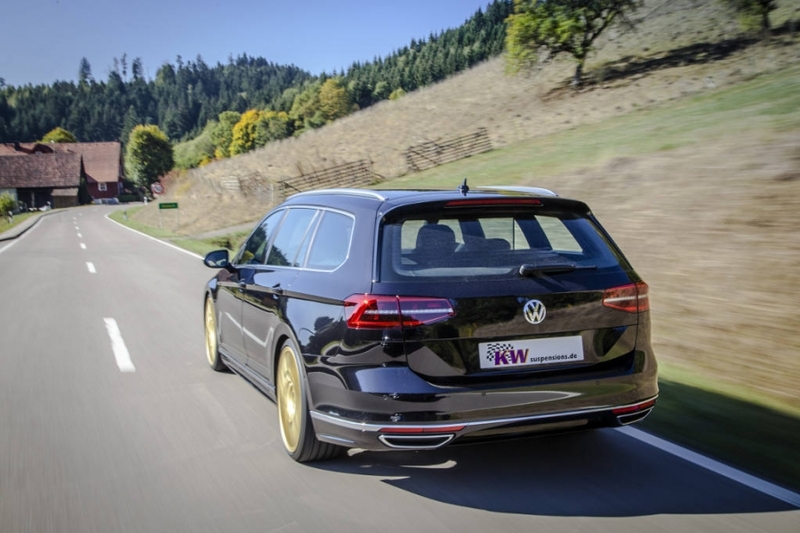 The VW-sensor constantly adjusts the KW DDC suspension setup to the respective driving situation and considers braking, steering and acceleration. So for example at fast overtaking maneuvers the damper adjustment gets more direct. The respective driving modes ‘Comfort’, ‘Normal’ and ‘Sport’ can be selected via the series button and are also displayed in the cockpit. 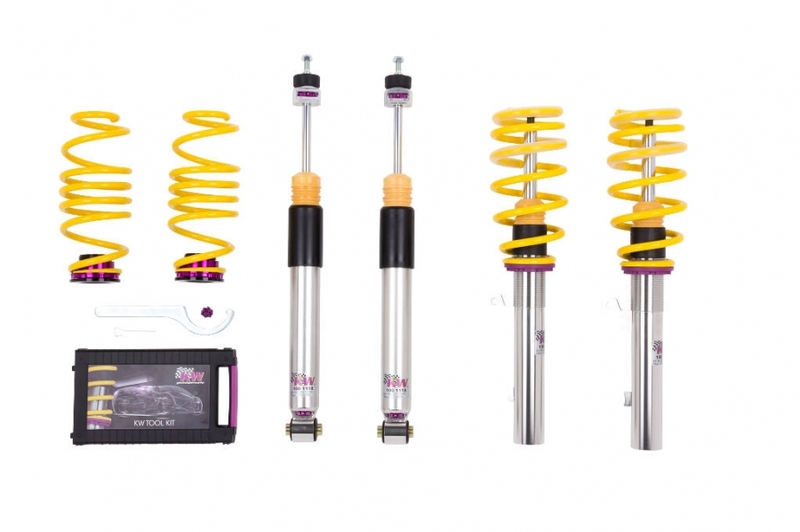 The KW coilover suspension Variant 2 differs from regular coilovers and series spare parts with its 16 clicks adjustable rebound damping. With the KW suspension, the driving behavior can be adjusted stiffer or more comfortable. This makes sense especially when changing to a different wheel / tire combination as the alloy wheels offered by Volkswagen. The perfect combination of more driving dynamics, every day practicality and setup possibilities are offered by the KW coilover suspension Variant 3. The Variant 3 with its separate rebound and compression damping adjustment is the first choice. Our damping basic setup that is pre-set to the by VW offered wheel / tire combinations can individually be adjusted when changing to larger wheels and tires. The rebound damping that is adjustable with 16 clicks allows to directly taking influence on the handling and comfort. When increasing the rebound force via the adjustment wheel, the body movements are reduced. The Passat drives with more directional stability and at fast cornering speed; the driving safety is increased by more stability. The compression damping that is adjustable in twelve clicks also gives the scope to individually consider the tire characteristics and further takes influence on driving behavior and driving comfort.